Tubular is the second level in the Special Zone of Super Mario World. Tubular consists of one long area, which the player has 300 seconds on the timer to complete. The level contains six Dragon Coins and only one exit. The first part of the level is a series of pipes of various lengths, with Jumping Piranha Plants and Chargin' Chucks trying to block Mario or Luigi's way. After this area, there is a long gap with three Power Balloons in ? Blocks that the player must get in order to cross a very wide pit. 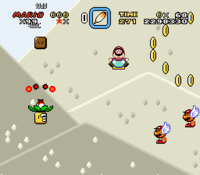 The player must dodge a multitude of enemies, including countless fire balls spat by Volcano Lotuses, Winged Koopa Troopas, and the Confused Chuck and Passin' Chuck variations of the Chargin' Chuck. 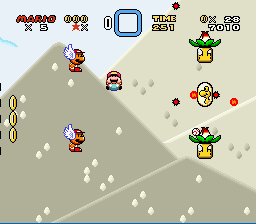 One alternative to this strategy is to start the level with a Cape Feather and Blue Yoshi. This way, the player can jump off of Chargin' Chucks heads and various ? Blocks until the column of Winged Koopa Troopas is reached. Eating one of these Winged Koopa Troopas allow the player to fly through the rest of the level, reaching the Giant Gate just in time. After the level is completed, the player is given the option to save. The level can also be done with purely the Cape Feather; however, this requires absolute precision as to exactly where Mario jumps and glides, including requiring him to jump on one of the Passin' Chuck's balls as it arcs downwards to get onto a higher platform. If Mario or Luigi passes the Giant Gate while under the effects of a Power Balloon, he receives a Super Mushroom. In the unreleased game Super Mario's Wacky Worlds, the title "Tubular" would have referred to a collection of three worlds. This page was last edited on April 5, 2019, at 23:59.